Lathan Goumas - lgoumas@shawmedia.com Jacobs quarterback Bret Mooney is tackled by Zach Thelen of Dundee-Crown during the first quarter of a game at Jacobs High School in Algonquin, Ill. on Friday, Oct. 25, 2013. 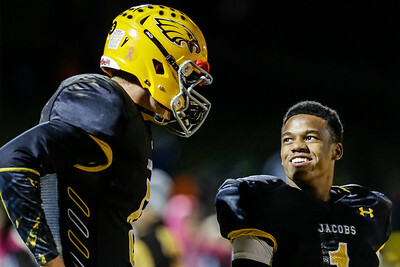 Jacobs defeated Dundee-Crown 24-7, making Jacobs the 2013 Fox Valley champions. Lathan Goumas - lgoumas@shawmedia.com Jacobs' Josh Walker runs the ball during the first quarter of a game against Dundee-Crown at Jacobs High School in Algonquin, Ill. on Friday, Oct. 25, 2013. Jacobs defeated Dundee-Crown 24-7, making Jacobs the 2013 Fox Valley champions. Lathan Goumas - lgoumas@shawmedia.com Jacobs's Cody Ferencz jumps in excitement after recovering a fumble during the second quarter of a game against Dundee-Crown at Jacobs High School in Algonquin, Ill. on Friday, Oct. 25, 2013. 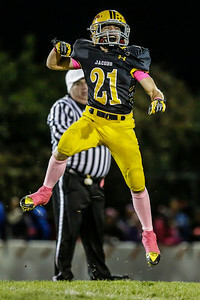 Jacobs defeated Dundee-Crown 24-7, making Jacobs the 2013 Fox Valley champions. 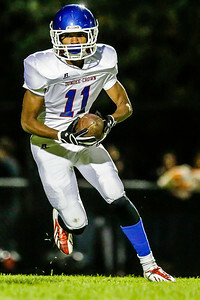 Lathan Goumas - lgoumas@shawmedia.com Dundee-Crown's Kiwaun Seals runs the ball during the first quarter of a game against Jacobs at Jacobs High School in Algonquin, Ill. on Friday, Oct. 25, 2013. 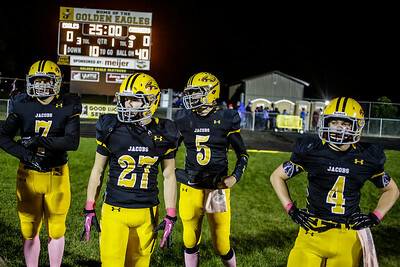 Jacobs defeated Dundee-Crown 24-7, making Jacobs the 2013 Fox Valley champions. Lathan Goumas - lgoumas@shawmedia.com Jacobs' Josh Walker runs the ball as Christian Ochoa of Dundee-Crown prepares to tackle him during the second quarter of a game at Jacobs High School in Algonquin, Ill. on Friday, Oct. 25, 2013. Jacobs defeated Dundee-Crown 24-7, making Jacobs the 2013 Fox Valley champions. 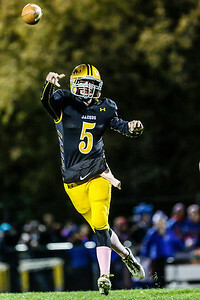 Lathan Goumas - lgoumas@shawmedia.com Jacobs' quarterback Bret Mooney throws the ball during the second quarter of a game against Dundee-Crown at Jacobs High School in Algonquin, Ill. on Friday, Oct. 25, 2013. 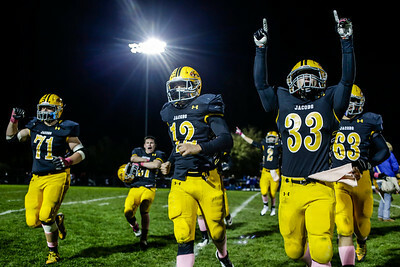 Jacobs defeated Dundee-Crown 24-7, making Jacobs the 2013 Fox Valley champions. 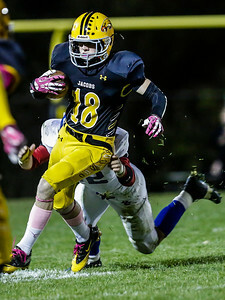 Lathan Goumas - lgoumas@shawmedia.com Jacobs' Camden McLain runs the ball during the forth quarter of a game against Dundee-Crown at Jacobs High School in Algonquin, Ill. on Friday, Oct. 25, 2013. 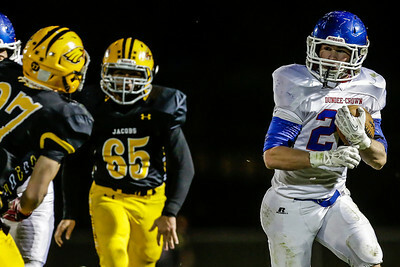 Jacobs defeated Dundee-Crown 24-7, making Jacobs the 2013 Fox Valley champions. Lathan Goumas - lgoumas@shawmedia.com Members of the Jacobs Golden Eagles celebrate following the fourth quarter of a game against Dundee-Crown at Jacobs High School in Algonquin, Ill. on Friday, Oct. 25, 2013. 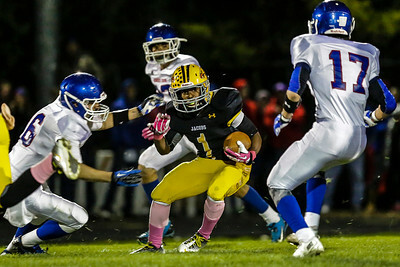 Jacobs defeated Dundee-Crown 24-7, making Jacobs the 2013 Fox Valley champions. Lathan Goumas - lgoumas@shawmedia.com Dundee-Crown's TJ Moss runs the ball during the fourth quarter of a game against Jacobs at Jacobs High School in Algonquin, Ill. on Friday, Oct. 25, 2013. Jacobs defeated Dundee-Crown 24-7, making Jacobs the 2013 Fox Valley champions. 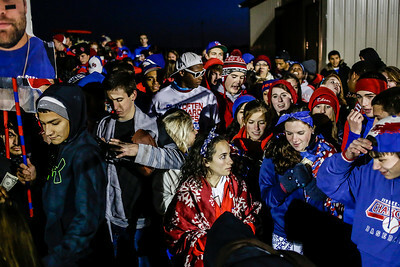 Lathan Goumas - lgoumas@shawmedia.com Dundee-Crown fans enter the stadium before a game against Jacobs at Jacobs High School in Algonquin, Ill. on Friday, Oct. 25, 2013. Jacobs defeated Dundee-Crown 24-7, making Jacobs the 2013 Fox Valley champions. Lathan Goumas - lgoumas@shawmedia.com Jacobs' seniors wait for the start of a game against Dundee-Crown at Jacobs High School in Algonquin, Ill. on Friday, Oct. 25, 2013. Jacobs defeated Dundee-Crown 24-7, making Jacobs the 2013 Fox Valley champions. 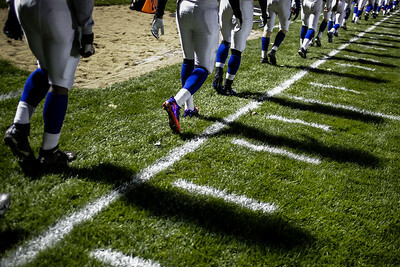 Lathan Goumas - lgoumas@shawmedia.com Dundee-Crown players march down the sideline before warming up prior to the start a game against Jacobs at Jacobs High School in Algonquin, Ill. on Friday, Oct. 25, 2013. Jacobs defeated Dundee-Crown 24-7, making Jacobs the 2013 Fox Valley champions. 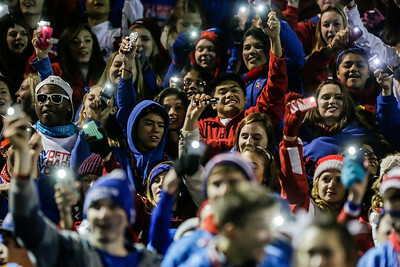 Lathan Goumas - lgoumas@shawmedia.com Dundee-Crown fans raise their phones as the cheer during the fourth quarter of a game against Jacobs at Jacobs High School in Algonquin, Ill. on Friday, Oct. 25, 2013. Jacobs defeated Dundee-Crown 24-7, making Jacobs the 2013 Fox Valley champions. 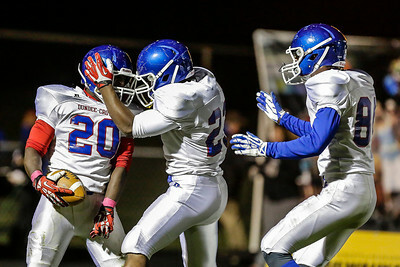 Lathan Goumas - lgoumas@shawmedia.com Dundee-Crown's Caleb Parsons (#20) celebrates with teammates after scoring a touchdown during the second quarter of a game against Jacobs at Jacobs High School in Algonquin, Ill. on Friday, Oct. 25, 2013. Jacobs defeated Dundee-Crown 24-7, making Jacobs the 2013 Fox Valley champions. Lathan Goumas - lgoumas@shawmedia.com Jacobs' Josh Walker (#1) talks with quarterback Bret Mooney during the second quarter of a game against Dundee-Crown at Jacobs High School in Algonquin, Ill. on Friday, Oct. 25, 2013. Jacobs defeated Dundee-Crown 24-7, making Jacobs the 2013 Fox Valley champions. 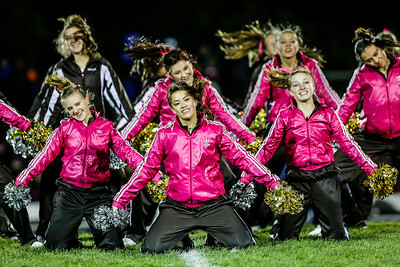 Lathan Goumas - lgoumas@shawmedia.com The Jacob's dance team performs during halftime of a game against Dundee-Crown at Jacobs High School in Algonquin, Ill. on Friday, Oct. 25, 2013. Jacobs defeated Dundee-Crown 24-7, making Jacobs the 2013 Fox Valley champions. 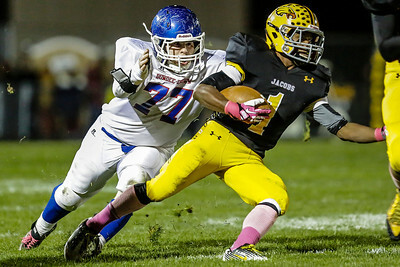 Jacobs' Josh Walker runs the ball during the first quarter of a game against Dundee-Crown at Jacobs High School in Algonquin, Ill. on Friday, Oct. 25, 2013. 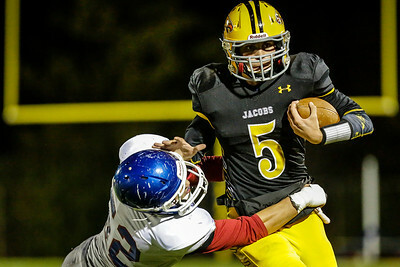 Jacobs defeated Dundee-Crown 24-7, making Jacobs the 2013 Fox Valley champions.